It seems to me like Fix and Forget Friday rolls around awfully fast……good thing I have an over-obsession with my crock pot. Anyway, today we’re fixing chicken. This dish is super easy and very tasty….of course it’s tasty. I sure wouldn’t post a nasty recipe on here – I have my reputation to think about. I save my nasty recipes for Barry who has to love me even if he wants to yak at dinner. I digress. Onward! 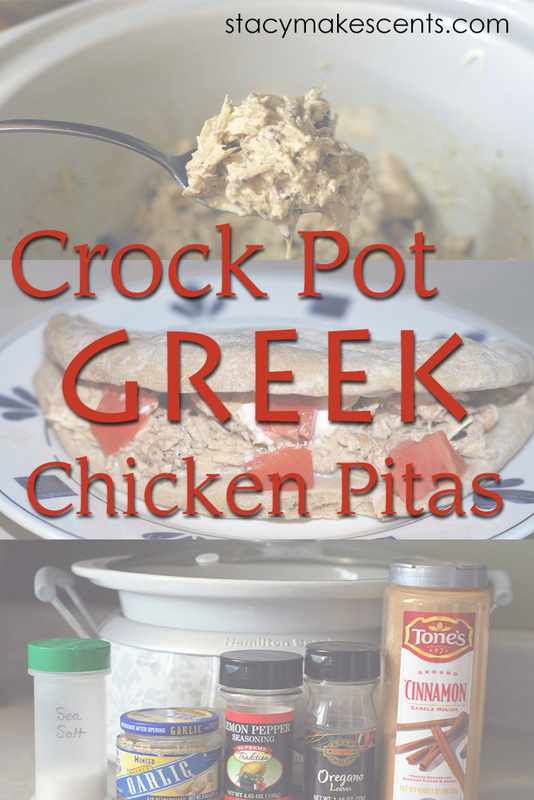 For this Greek dish, you’ll need boneless chicken thighs, onion, garlic, lemon pepper, oregano, cinnamon, salt, pita bread, sour cream, and chopped tomato. What makes this dish “Greek?” Well, the spices I guess. I actually have no idea why it’s Greek. I just know this is a recipe I modified from a cookbook and it was called GREEK Chicken. So, I went with it. If it’s in a book, it must be true – just like the internet. 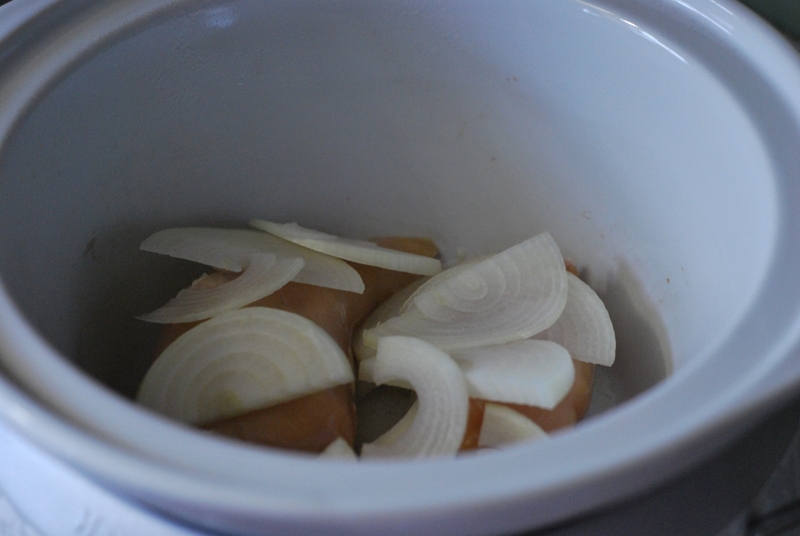 Lay your chicken thighs down in the bottom of a greased crock. Lay some thinly sliced onion on top. Am I the only one that thinks that raw chicken just looks……weirdo? Dollop some garlic on top of that……not too much because you do have to be around other people. 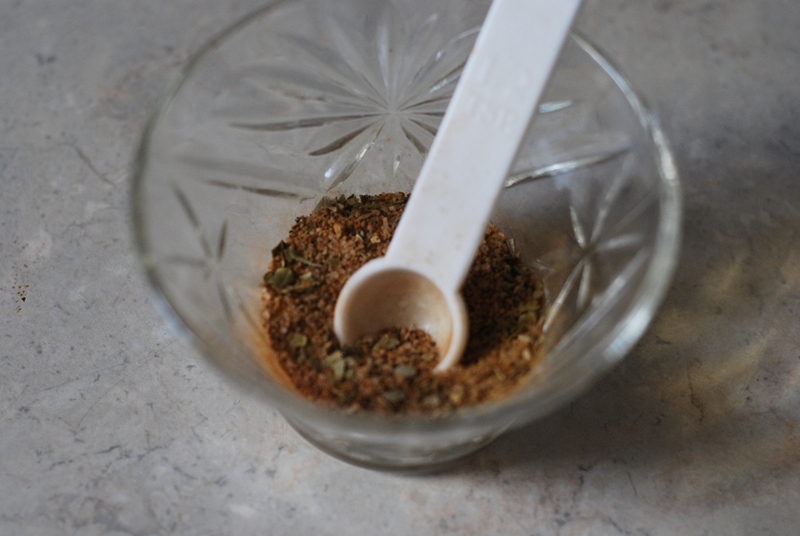 In a very small bowl, mix up the lemon pepper, oregano, cinnamon, and salt. Sprinkle this over the chicken. Guess what? No stirring. I know……I just like saving spoons from having to be washed. Sprinkling is better than stirring – although for me, they still create the same amount of mess. Just call me Grace; Barry does. Cover and cook on low for about 6 hours. You could let it go for 8 if you needed to – like if you get busy dusting and forget all about dinner. Or if you’re cleaning all the baseboards in the house. Or if your nostrils aren’t working and you can’t smell that the chicken is done. Those are good excuses. 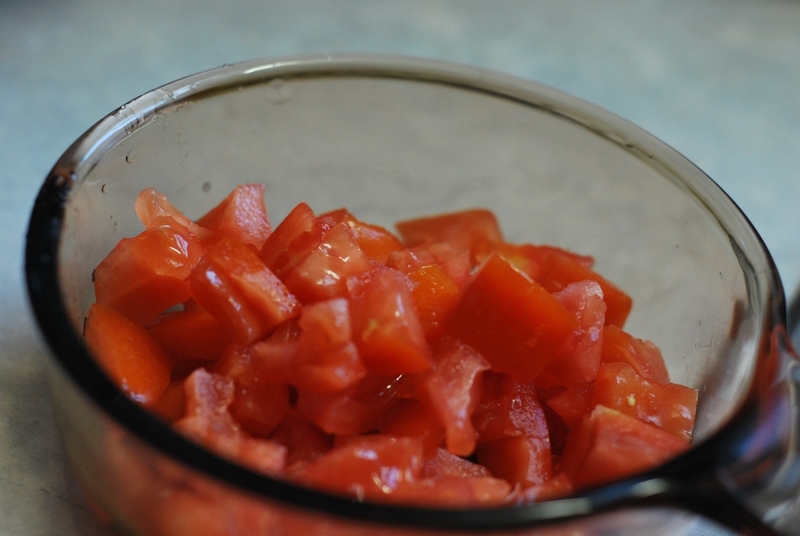 Take a break from all that dusting and chop up some tomato. It will be the topping for your pita. I got all the “goop” out of my tomato so it wouldn’t be watery. I do this by cutting it in half and then squeezing its guts out over the sink. It’s a very technical process. 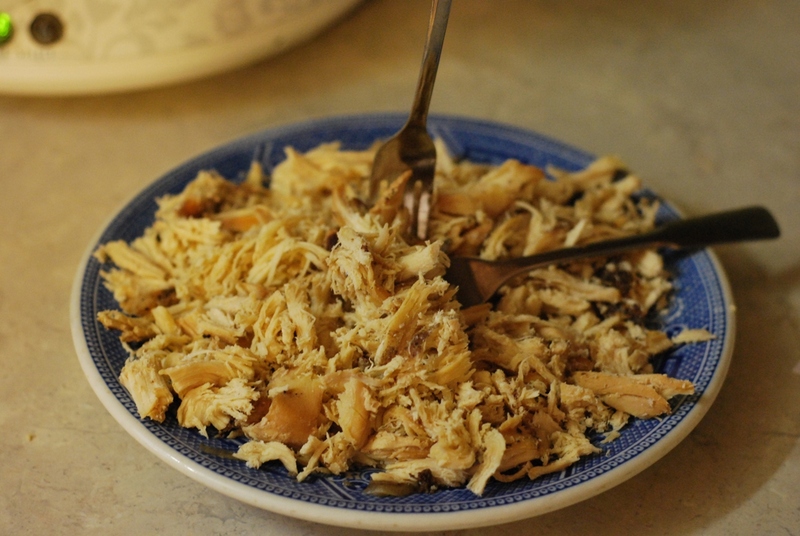 After 8 6 hours, remove the chicken from the crock pot and shred it with two forks. It should be very tender…..this part is really easy. The hard part is not eating it. You serve this lovely dish by using pita bread as a taco, like shown. Add tomato. I haven’t made pita bread before, so I buy this delicious version from a lady at the Farmer’s Market. 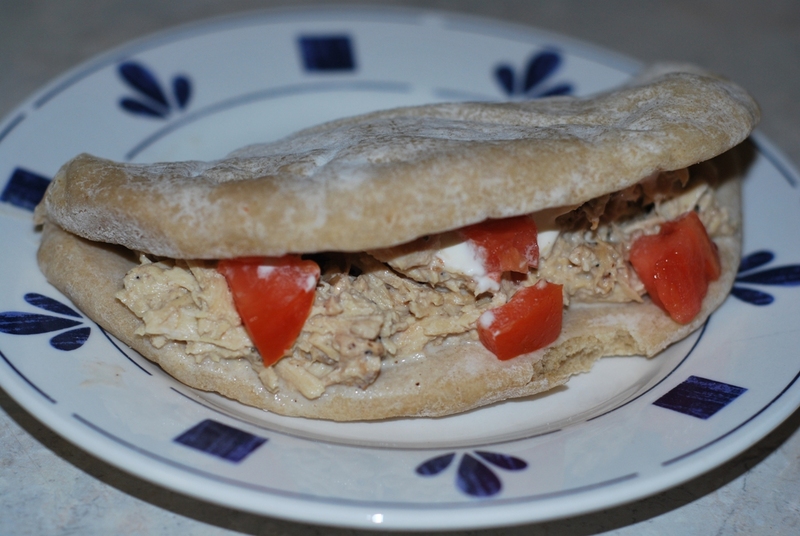 *Slobber* If you don’t want that much bread (I can still love you), then cut your pitas in half and open them up, spooning the chicken down into the pocket and sprinkle tomatoes on top. NOTE: This dish makes four servings. 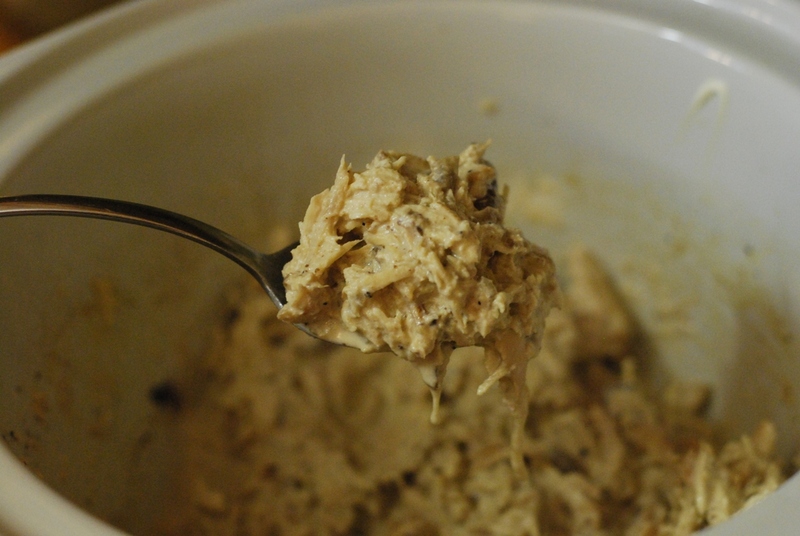 Lay chicken in the bottom of a greased crock. 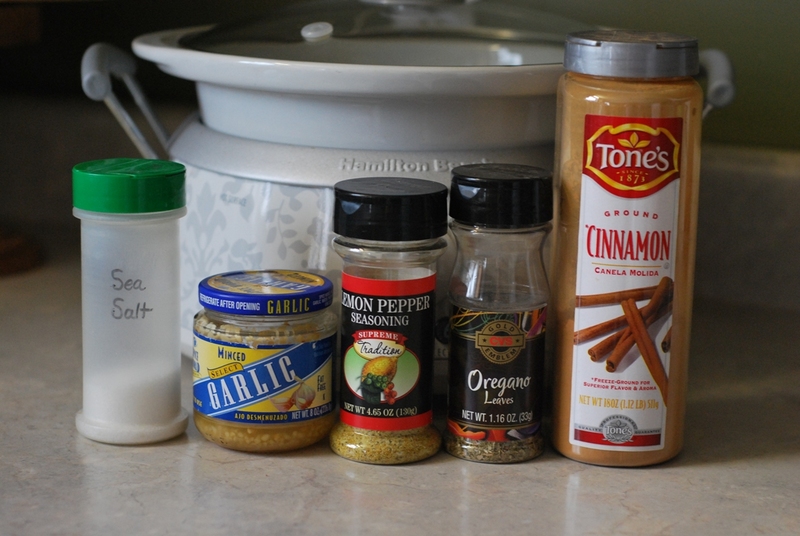 Place onions on top and sprinkle garlic and spices c over everything. Place lid on and cook on LOW for 6-8 hours. When chicken is done, remove it from the crock and shred it with two forks. 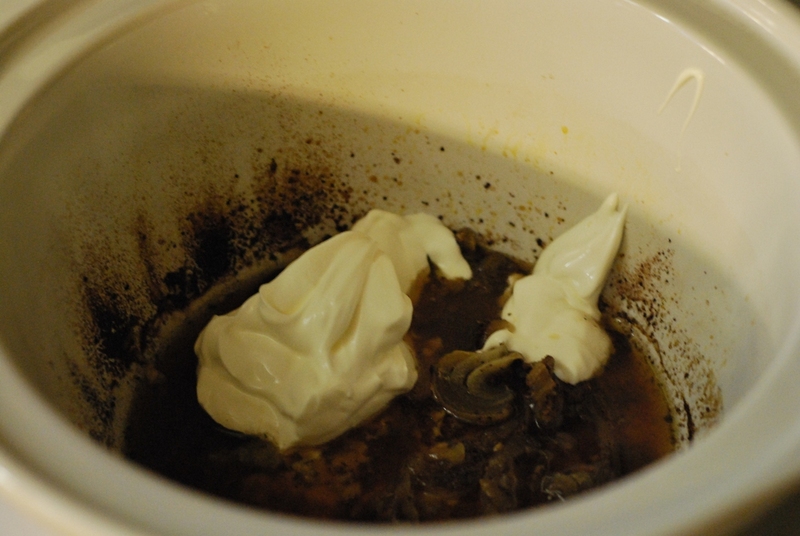 While chicken is out of the crock, stir in sour cream. Add chicken back to crock and stir well. Ladle chicken onto warm pita bread, using it as a taco. Sprinkle with tomato. Fold over and serve. I am sad that people made it so you needed to turn off commenting on your 100 Days of No Processed Meals – Crock Pot Style page, but that’s okay, I will comment here! I suppose it’s more fitting anyhow since this is one of my favorite recipes. Can I just say THANK YOU! I constantly go back to the recipes you’ve shared with us. I love enjoying them with my family and feel guilt free indulging in them because the processed stuff is removed. For someone who is constantly busy and doesn’t have the time to read the 10 million books with contradictory information on food, I just wanted to tell you I appreciate your blog. I not only use it constantly when meal planning, but I share it with friends and family all the time as well! P.S. A note to Cathy- yes, I use Tzatziki with this everytime and it’s wonderful. I’m so glad you like them!!!! 🙂 Thank you! Has anyone skipped the sour cream and used tsaziki instead? I haven’t – but it sounds like a great idea! This looks great. I am retired but work party time and live the rest. I love meals that I can just through in a crock pot and then go do what I want to do after all those years of having to be at school for everyone else. I hope you enjoy it, Jan! It’s one of our favorites. This is so yummy! We’re adding it to our list of favorites! I’m so glad to hear that, Kailey! We LOVE this recipe and plan to make it for a larger group for a get together. I’m fairly new to the crockpot. Would it work to have two layers of chicken thighs? Put onions and seasonings on top and in between? Fingers crossed! Have you ever added feta? I am trying these tonight and my family LOVES feta but I am not sure if it will taste weird? Trying this for dinner tonight. You might want to change your printable directions. You mention the garlic, but none of the other spices. Had to log back on to see if there were further directions. Thankfully, there was an explanation above! This was great. My picky kids actually loved it. 🙂 Welcome…holler if you need something. This was amazing!!! I used boneless breasts and added extra sour cream (because I love sour cream ) thank you! PS I didn’t add any liquids, just the breasts, and it came out lovely. One of my favorite things about going to the fair is the food. Greek gyros were always at the top of my list. I think these ight be even better! I added 2 extra cloves of garlic and some red pepper. Everyone loved them, even the three littles. Thanks! WOW! 🙂 Thank you…that’s a big compliment. Found you through a pinterest link. So glad i did! We began eating organic, non gmo s few months ago. Your recipes are going to make my life easier! Thanks! 🙂 I’m happy to hear that! This recipe was great! I forgot to add the clove of garlic! 🙁 So I added it later and found the cinnamon overbearing so I added garlic powder. And that helped balance it. I also thought this was a bit heavy on salt. But it is definitely a keeper! Thanks so much for sharing!! That’s likely – because I’m a salt lover. 🙂 Glad it worked for ya! So Im making this with breast meat, do I need any liquid? Will it dry out? I dont use a crock often so Im not sure. This is the second time I’ve been to your site this week. 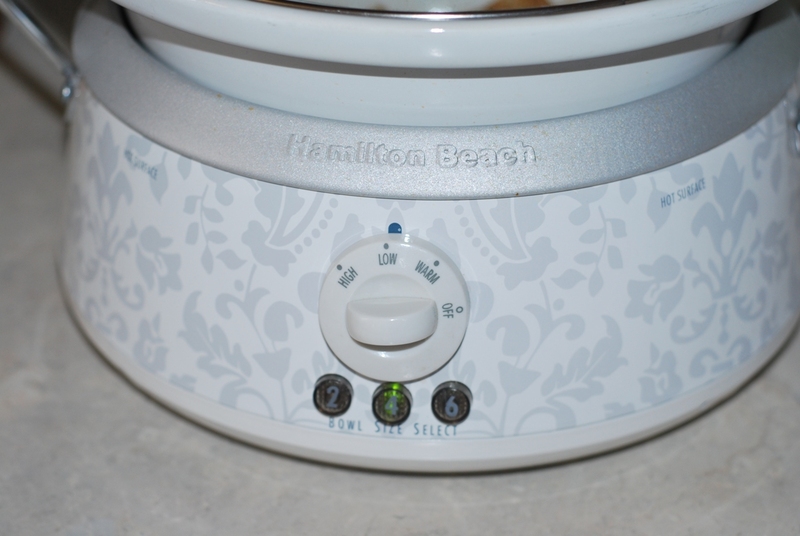 You have quite an arsenal of crock pot recipes and you should think about publishing. We’ve got you book marked! Pitas are always a hit at our house. 🙂 I post a new one each Friday….and I hope that this year I’ll be putting out a cookbook. Love the bite out of the pita. I have found bites out of random things before… strawberries (with the tip of EACH ONE gone) and the other day the stick of butter that had been sitting on the counter. That one made me laugh. This looks yummy, but I have no idea where to get boneless chicken thighs unless I cut them myself. We have a great little store called Ingles and they sell organic boneless skinless thighs. 🙂 Any cut of chicken would work. That’s why every saturday last year we went to the farmer’s market before eating breakfast, and got cinnamon rolls. To support the sweet amish lady who sold those yummy cinnamon rolls. I believe in supporting all sweet people with cinnamon rolls. Amen. This looks delicious!! I would probably use chicken breasts….I don’t like dark meat. I know, I’m weird. And Will doesn’t like tomatoes, so he’d have to go without. And I sure wish we had your farmer’s market lady around here! It’s good without the tomatoes too. 🙂 I don’t care for dark meat either, but when I shred it and mix it all together I can’t really tell. If you use breasts, it might be dryer and I wouldn’t let it cook past 6 hours. That sounds really good! Kind of like a chicken gyro. Yum!